Hayes’ Paul Burris soars in for an easy hoop during the first half of Tuesday’s OCC showdown against visiting Worthington Kilbourne. 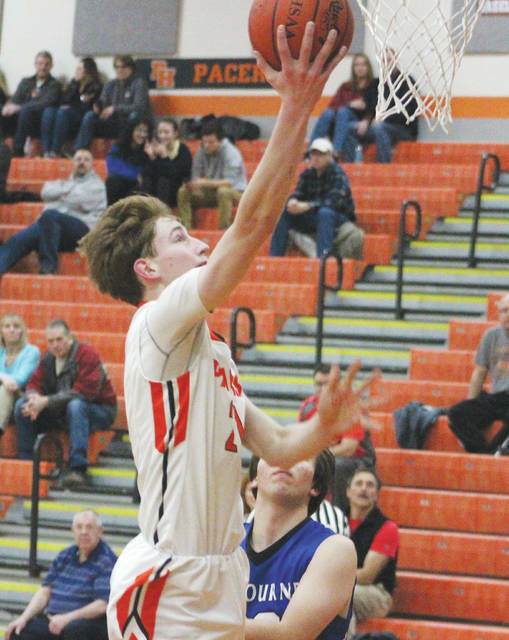 Jake Hirschy’s three-pointer with 13 seconds left gave Worthington Kilbourne its first and only lead in a 58-55 win at Delaware Hayes in OCC-Cardinal boys basketball action Tuesday night in Delaware. Hirschy’s shot came after the Wolves used a 12-0 run in the fourth quarter to overcome a 17-point halftime deficit. Delaware was plagued with foul trouble all night. Terin Kinsway, who leads the team in scoring for the season, and Paul Burris, who led the Pacers with 17 points for the game, both fouled out in the final four minutes. Kinsway missed most of the third quarter because he had four fouls. Thomas Wilson scored a game-high 19 points to lead the Wolves (8-10, 6-5). But, it was Zach Wilson that proved to be a big factor in the final stanza. He scored all seven of his points in the frame – including six during a 12-0 run that pulled the Wolves within 52-50 with 3:17 remaining. Burris came through on Delaware’s next possession with an and-one that seemingly put momentum right back on the side of the Pacers. But, Thomas Wilson buried a pair of free throws after an offensive rebound and corralled a second offensive board off a Hirschy missed three and put it back in to cut the deficit to one with 0:33 left. Paul Frentsos missed the front end of a one-and-one – the third of the period for the Pacers, who were 12 of 16 in the first three quarters. Baker, falling down, found Hircshy in the left corner, who buried the game-winner to give Kilbourne a 57-55 lead with 0:13 left. Nate Griggs missed the front end of a one-and-one before Zach Wilson knocked down 1 of 2 for the Wolves on the other end accounting for the final margin. Baker finished with 13 points for Kilourne, including eight in the third quarter, and Chase Brown chipped in eight. Delaware used a 14-2 run in the opening quarter to take control and pushed the lead as high as 17 twice in the second, including a Burris three-pointer from the corner at the buzzer to give the Pacers a 40-23 lead at the break. Burris had 17 points, Griggs finished with 16, Frentsos added nine and Jwan Lyles chipped in seven for the Pacers (7-11, 5-6). Delaware closes OCC-Cardinal play at Dublin Jerome Friday night at 7:30 p.m.